Round Robin is a fresh technological innovation hub specializing in software. 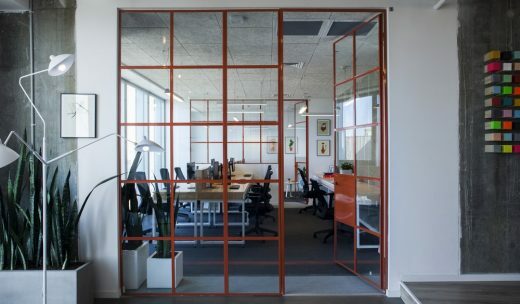 They partner with leading companies and co-found promising start-ups. From games to websites, the studio functions like a tightly knitted platform where the customers get way more than what their bargained for. 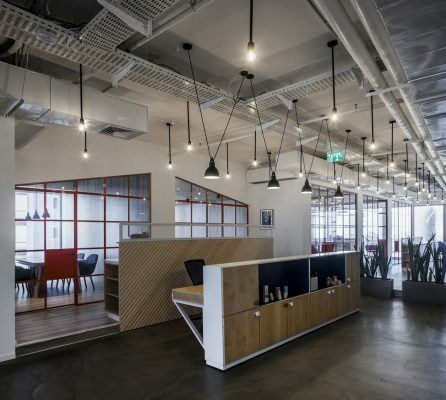 As the team started getting bigger, Round Robin partnered with Roy David Architecture Studio to design their new 1200 sqm office space offices located in the Stock Exchange District, Ramat Gan, Israel. 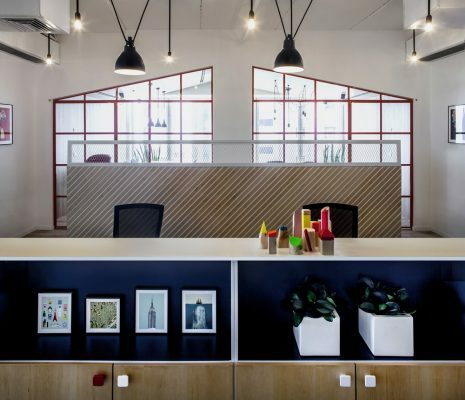 The initial brief was to allow the 3 different divisions\companies, Round Robin, Eventer & Spartonix, to co-exist and allow dynamic transitions between the varied departments of the companies. 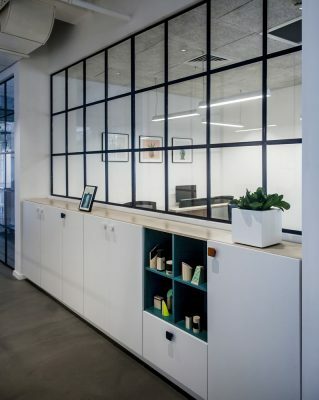 This insight gave life to a design proposal which included six unique developers room modules consists of a team leader room and 4-6 developer working stations. Each of the modules where separated by a custom made dynamic walls that when in need could be opened and allow a big open space for the three teams bordering with one another. As specified above, the overall layout is divided into three sectors, linking the three main directions the company is extending in. 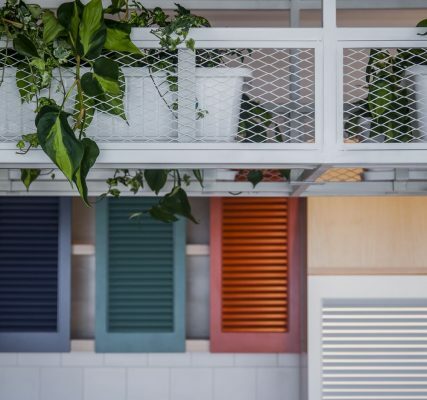 Varying in size, the spaces are designed using natural wood, a bright and colourful colour palette and slim dividing metallic walls. 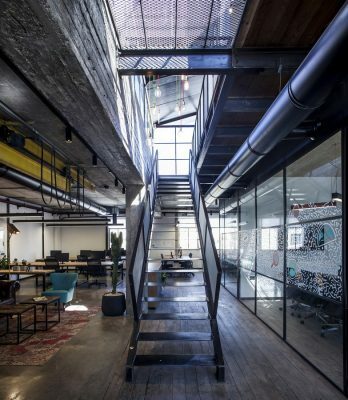 The open areas question the limits of open space working, from elevated platforms tightly packed with beam-bags to a jam room & VR gaming area situated in the middle of the space, each element is calculated so that the layout reflects the company’s easy-going style. 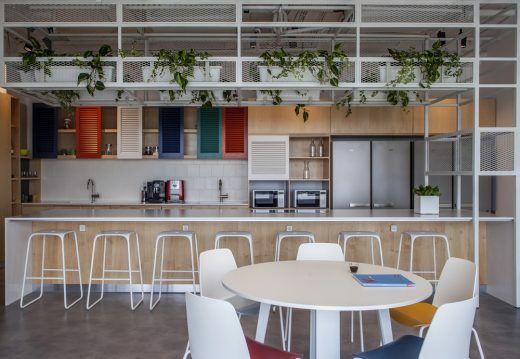 The design & styling approach of the new office is inspired by the essence of Scandinavian design with a touch of geometric details, all styled in three distinct colours, specific to each branch of the company. One can find from patterns to the colour palette a consistent design in perfect sync with Round Robin’s brand core values. 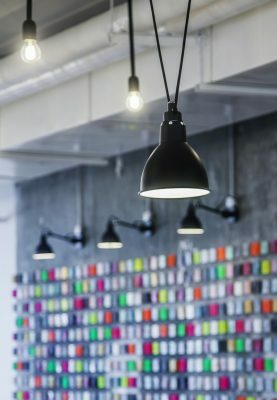 A series of custom made elements link all the sectors together, the conference rooms having a home like appearance, the open kitchen and dining along with the private phone-call booths all work together to light up the space and make it feel like a second home. 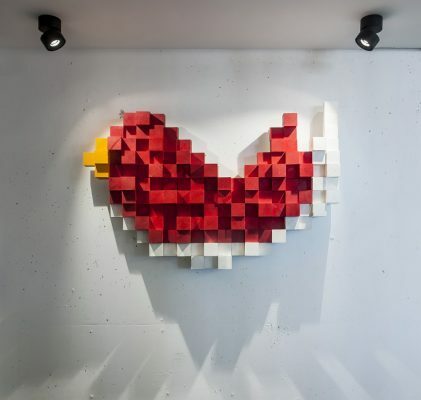 The architecture studio partnered up with the artist Ohad Benit in order to create a series of wall installations inspired by the screen pixel form. 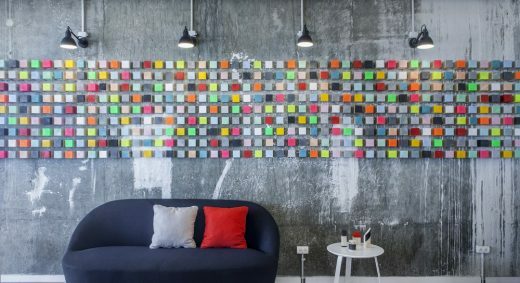 The installations pops the space up with pantone marker colours which makes it fun, inspiring and joyful to stroll around the space during working hours.